Photive has modest brand recognition, but for audio heads, who are concerned with getting the best sound quality for their dollar, this maker may hit the mark. Recently they released two new sets headphones, the BTH3 and BTX6. We will be focusing on the Photive BTH3 because, although the headphones lack a few of the niceties their counterpart has—like being collapsible, they produce a relatively solid sound. The package you'll get is pretty bare bones. Other than the headphones themselves, you basically only get a user's manual, travel case, USB charging cord, and 3.5m audio cable. We aren’t complaining though, because even for a set triple the price you won't do much better. The Photive BTH3 biggest selling point is that it fills a much-needed gap in the marketplace. While you can certainly purchase many cheaper headphones, the quality is not always there. The 40mm drivers this set boasts deliver a sound that is uncompromised. The bass is sufficient, and the highs and mids are relatively solid and crisp; we will discuss those aspects in more detail later on. The Photive BTH3s are more about function than making heads turn. The overall color used is black, which makes them look sleek and professional. They are not flashy or high on design and are perfect for people who are not trying to attract attention to their set. That said, they are not unattractive, so you won't be embarrassed to be seen in them. The earmuffs are nicely padded in leather and are firm while still comfortable. You won’t find them to be as cushioned as more expensive options. However, their lighter weight makes it less noticeable. We should mention that the muffs on the Photive Bth3 do start to get a little hot around an hour into wearing them so that you will need a breather here and there. For that reason, we would not advise them for use while working out. Their body is slimmer than some other options, a bonus if you don’t want anything bulky. Still, after a couple of hours you will feel the set on your head. They don't have the barely there feeling of designer headphones. The construction is solid, but not rugged. There are no obvious weaknesses in the construction, and they seem relatively durable. That said, they are not so durable you can toss them around without worry. While not collapsing could be a drawback, it also affords the Photive BTH3s with the ability to adjust more. The ear cups have a good range of rotation, and the headband is very accommodating. It is easy for a wide variety of people to get a more custom fit, increasing their comfort. Speaking of the fact they don't collapse, we give this set extra points for having a hard-shell travel case. Even with more expensive sets you often only get a soft case, and sometimes none at all. The case is only slightly bigger than the headphones themselves, so it is still relatively compact. It is important to note; these headphones are not useful for every type of listener. If you love EDM, hip-hop, house, and genres such as those, you will likely get the sound you re looking for. If your tunes will suffer from cut off in the highs, like jazz, punk, or metal, you might want to pass. While we have compared the audio quality of this set to manufacturers like Bose, the BTH3 headphones lack the ability to cancel noise. Even passive noise breaks through, so the problem is pretty profound. They are not ideal for commuters, use in an office setting, or for any other listener who will not be in a more isolated environment. We should point out that the bass response can be sluggish. Even though the dedicated control buttons are a unique feature, some users find them fussy. You may also experience some sound cutting if your device has poor connectivity, despite the distance. A common complaint is that they can cause a bit of an echo during phone calls. Still, they are impressive for their price. 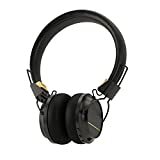 There is a place in the market for headphones with higher quality features and a thought out design at a budget price. If you go in knowing you will miss out on some of the premium features offered by more expensive models, you won't be disappointed. We have discussed the appearance, unique features, benefits and even some drawbacks of the Photive BTH3 headphones. However, what really matters is their performance. To start, these headphones are Bluetooth compatible. Pairing them is simple, despite the fact they lack the audible instructions more pricey models offer. Instead, there is a flashing light on the left ear cup that alerts you. The set automatically begins to broadcast once it is paired. Following the initial pairing, they will immediately broadcast once turned on near a known device. The Bluetooth range is advertised at an impressive 33ft. If your connection is solid, you can use up every inch of that distance. However you can’t push it, once you step out of range, you will immediately experience cutting, skipping and dropping. Also, if your connection is weak, you may experience problems at closer ranges. The latter is less an issue with the headphones and more an issue with your device quality. Left Ear Cup - The left ear cup has the play and pause button. It also has skip, rewind and back buttons. Right Ear Cup - The right ear cup has the dedicated power button. As well as the volume buttons. If you love having control, this is the set for you. They minimize the need to master handling multiple functions on just one button and increase the ease of use. However, for those who like to keep things simple, the sheer amount of options may not be a bonus. There is a microphone, and it works…that’s all we can say about that. No, seriously, the mic is functional, but not impressive. There have been complaints about echoing with some devices, and you can end up sounding as if you are far away, or in a tunnel. The quality is not a huge leap downward from when you speak directly into your phone, but it is noticeable. We are not willing to count this as a serious flaw, given at the price point everything can’t be perfect. The lithium-ion battery is supposed to carry a listening time of twelve hours. Even using Bluetooth at higher volumes, it easily hits that mark. If you do manage to drain the battery, the 2-hour rapid charge is solid, so you can be up and running in no time. The port for charging is located on the right ear cup as well as the audio jack input. Speaking of ports, while these are not technically waterproof, both inputs are covered so moisture and debris won't easily get into them. Now to the sound quality, because bells and whistles are nice but at the end of the day how they play is most important. As we mentioned earlier, the Photive BTH3 uses 40 mm drivers. However, you may find their sonic signature to be different than more expensive units outfitted with the same mm drivers. This is to be expected, especially if a unit is directed toward a different type of listener. The Photive BTH3 has sufficient bass, it is not lacking in strength, and the sound is not watered down. However, it is not overpowering or emphasized as much as, for example, the Photive BTX6 either. As mentioned earlier, the bass response is a bit sluggish. The slower response may lead to a lack of tight focus when listening to certain genres of music. The dual drivers mean the mid sound is not boxy, which is a common problem in single drive units similarly priced. There seems to be s subtle boost, perhaps to give the vocals a push, around 1 kHz. Because it is subtle, it is not disruptive nor does it adversely affect the sound quality. The highs are eerily crisp, almost too crisp. It is not that the highs are overemphasized per se, however on some songs you can hear a sizzle. The flaw is not always there, but you will notice it at some point. The 3.5m cable is compatible with most phones and tablets. It has a soft to the touch rubberized exterior. They are highly controllable. There are dedicated buttons to the sides of both ear cups for specific functions vs. the one multifunction button common with other Bluetooth-enabled headphones. They automatically reconfigure to known devices, saving you time. The 450 mAh lithium-ion battery has a fast charge and long life. The set is able to fully charge in under 2 hours. The life is about 12 hours, and the battery can be removed easily. No noise cancelation makes them not suitable for commuting and other public settings. We picked a couple of similar products available on the market to see how they compare to the Photive Bth3. The Regents are attractive with a simple build. They come with a bare-bones package that includes a micro-USB charging cable and an aux cable. The muffs are padded with a lower quality but attractive foam. The battery life is 24 hours which is better than the Photive by double. Max operating distance is 33 feet, and they are stereo with Bluetooth 4.0. These Bose headphones are comfortable and feature patented noise canceling technology that can be adjusted to the listeners liking. They have one-touch pairing function and an optional app for multiple device toggling. The units can be used even after the battery dies because of the passive power stored for their noise-canceling technology. Voice prompts are used for everything from battery life to caller ID. This set also includes a 47-inch cord for optional wired listening. Considering they can cost up to 400 dollars, we are disappointed they only have a 1-year warranty. The Hesh 2, also called the Hesh 2 Unleashed has an interesting design and decent sound. Some of the features of the set are well thought out, if not a little odd, like hiding the Micro-USB underneath the phones headband. The headphones come with a mesh carrying case, cord with mic for wired use, and a USB charger with no bank. They have a three-button control, including large plus and minus signs that make finding your controls easy but are unattractive. The units are not noised-canceling, but they have a 15-hour battery life which is slightly better than the 12 hours Photive provides. Although the BTH3 headphones have a closed back, the soundstage is impressive for the price. Using the Bluetooth does not diminish their sound, which is a testament to the overall quality level of the set. These headphones are very well balanced, and they sound pretty good given all we discussed above. It can be argued that, although Photive also created the BTX6, there is no reason, sound wise, to shell out the extra money for them because the less expansive BTH3 are sufficient. Considering these headphones sell for between fifty and seventy dollars, depending on where you buy them, they are pretty solid. Flaws such as the fact they are not bass heavy, or ultra comfortable for long wear are negated by the fact they are light, adjustable and have an amazingly balanced sound. These definitely blur the lines between whether a slightly more expensive set would be better. The Photive BTH3 are ideal for people who want total control and excellent sound at a reasonable price. They are one of the best sets you will get in this price range, and it is almost a sure bet you will be satisfied with them if you don't set your expectations too high and consider all the points we covered. That said, there are better headphones on the market, just not necessarily in this price range. So our review can be summed up saying that the competition for the BTH3’s is very slim. 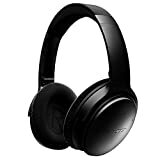 The Photive BTH3 is a good over-the-ear wireless Bluetooth headphone featuring a built-in mic and 12-hour battery life. Furthermore, it has a 40mm drivers which deliver an incredible sound that isn't uncompromised. It also has sufficient bass, and relatively solid and crip audio quality. Overall, we are giving this a 3.8 out of 5.